Pipe Houses. The alternative to high land prices in Hong Kong. So you think that that the price of the properties is again rising out of control? Well when things get out of hand, there is someone who will come up with an idea that although at first may seem preposterous however when examined in more detail it could be the solution to a grave problem. I am referring to pipe housing. These concrete pipes enabled as homes are the last residential proposal, to face the scarcity of land and the high prices of housing in Hong Kong, which a local architectural studio presents at a design fair in the city. His project consists of two large diameter concrete pipes, (pipes that have been previously prepared) which are used to drive the water of the city, connected to each other and conditioned to offer the tenant a net space of 10 square meters. With this idea, they try to maximize the residential area in one of the cities with the most expensive land price in the world, where their high cost restricts access to a small minority. A city with the most expensive land price in the world. When I say expensive I mean expensive. Last month, for example, a new top price was recorded with the payment of 2.21 thousand million dollars that a consortium of Chinese companies made for a land with views to the bay, becoming the most expensive buildable land sold in Hong Kong. The project director of these pipe housing, Jonathan Kong, argue that they wish to offer economic ways to alleviate the crisis of affordable housing for young people in Hong Kong. 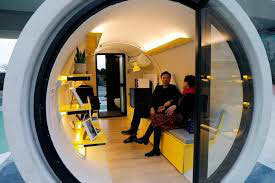 Each of these so-called "pipe houses", with dimensions of five meters long, two wide and two high, has a bathroom with shower, a kitchen, a living room with a sofa bed, a storage and two glass doors at each end of the pipes where natural light is accessed and received. The manufacturing price of each unit is 120,000 Hong Kong dollars ($ 15,300), "less than a car," Kong says, and can be built in less than two weeks. These modular homes can be stacked one on top of the other until they reach a height equivalent to a four-story building. In addition, they are installed and disassembled in a short time, offering the advantages of creating fast residential spaces, at little cost and easy to adapt to environments. These architects argue that they can fit perfectly as housing for university students, also for commercial use, as hotels, for those who are passing through or for those who begin to become independent of their families, but their options are open. Apparently they want to try out this project for the first time in South Africa. The solidity of the material, its insulation capabilities to heat, humidity and strong winds are the reasons for the use of concrete as a material compared to other alternatives for fast housing that are proposed also for Hong Kong, according to Kong. The "pipe houses" are an example of the numerous ideas that in recent years have tried to offer alternatives to face the high prices of homes in Hong Kong. In October 2016, the real estate developer Emperor International Holdings proposed, for example, the conversion of a 21-story commercial building in the city into a residential building with apartments of 5.7 square meters. A month before, a buyer paid 502,000 million dollars for a 15.2 square meter apartment in this luxurious building. The "pipe houses" have among their competitors those who want to convert freight containers into temporary homes, as is already done in countries such as the Netherlands. The Chinese alternative proposes to use underground and abandoned parking lots to locate these cubicles of 20 square meters equipping them with their own bathroom, kitchen, air conditioning and windows, with a construction cost of $ 25,000 and nine months of manufacture. In Hong Kong, the capsule beds are also in used, a concept copied from Japan that offers the tenant access to a cabin that resembles the shape of a "space coffin", two meters long by one high, with a bed of 90 centimetres, air conditioning, light and internet access, as a home. Sandy Wong, a Chinese businessman, is the developer of this idea in Hong Kong, where he has more than fifty capsules beds distributed in different apartments in the city and with a cost of up to 500 dollars per month.